After a gold treasure discovery in Caesaria, Israel once again reported the discovery of another historical treasure trove and this time, the cache featured Hellenistic silver and bronze coins and other objects estimated to be 2,300 years old. This was confirmed by the Israel Antiquities Authority, and according to the officials of the agency, the collection of coinage and objects is one of the most important discoveries in the region and will require more time before the treasure trove can be studied. The excavations in the cave started out February this year, lead by Reuven Zakai, Hen Zakai and Lior Halony, all part of the local caving club, as they took the responsibility of exploring the area for stalactites before the rest of the club members descend into the cave. According to reports, the three initially explored the narrow passages of the cave and checked the interior for a number of hours. It was Hen, the youngest of the three, who discovered a shining item when he explored one of the narrow passages in the cave. Upon careful inspection, he discovered ancient coins, and when inspected further, it was revealed that the coins where produced during the time of Alexander the Great, a conqueror of Israel. Aside from the silver jewelry pieces, the cache also includes rings, earrings, bracelets and coins and was stuffed in a cloth pouch. According to authorities, the stash has been hidden in the cave for the last 2,300 years. Archaeologists later explored the idea that the stash have been hidden by locals who were fleeing from the unrest after Alexander the Great died, in the hope that they can later retrieve the coins during better times. As soon as the spelunkers saw the stash and recognized its value, the team immediately reported the discovery to the Prevention of Antiquities Robbery, a unit of IAA to prevent potential robbery. The team officially visited the area last March, and they were accompanied by a team from Israeli Caving Club. 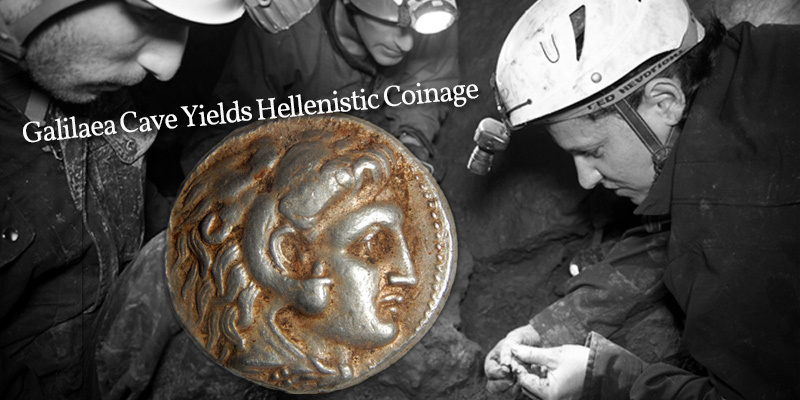 As soon as the authorities checked and inspected the area, they acknowledged that some of the artifacts date back to more than 6,000 years ago, and the coins in the stash were identified to have been produced during the start of the Hellenistic era. Aside from the coinage and jewelry, authorities also discovered ancient pottery with some of the items bonded together with the limestone. Authorities agree that the artifacts will help them find an accurate dating, and also understand how stalactites developed. The director of the anti-robbery unit of the agency commended the group for their discovery, and cited them for their behavior in bringing the find to an appropriate agency. Amir Ganor who heads the unit added that the citizen awareness helped in preserving and advancing knowledge in archaeology and antiquity in Israel. The agency also emphasized the Law on Antiquities about state ownership of all finds, and selling or failure to report such discoveries are punishable by law. It also added that the cave where the stash was discovered should remain a secret due to the dangers posed by the area, and of course to protect its valuable contents.